Karen and I went all out. We packed medium sized US Post Office pre-paid boxes. Boy can you get a lot of fabric in one of them! Unfortunately it did not seem to make much of a difference in my scrap bins. I wish I had weighed the box before I dumped it out. Here is the box I just received (Sorry for bad picture. This is indoors on a dull Michigan day. I broke the camera with the flash on our recent vacation.) Amazing that there is nothing in the box that I already have, and I have a lot of fabric! There are many in the box that will go into my, yet to be completed, Color Challenge quilt. I wonder what Karen will think when she gets mine? 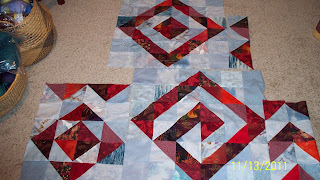 I think I will make 1/2 square triangles with one side one of my stash light fabrics and the other with made fabric. Something like this, just using made fabric for the red. Thanks for sharing. What fun to see what you got! Glad you liked it. Can't wait to see what you do with them. It's always a good day when fabric arrives, whether by the brown truck or the little white Jeep. Love the oodles of goodies!! !